The “Three Holy Hierarchs” was an early 1890s pre-dreadnought battleship of the Imperial Russian Navy, the best protected in her class with thick Harvey armour, and first fitted with a radio. She served with the Black Sea Fleet and opposed the mutiny of the Potemkin in June 1905, duelled with the SMS Goeben/Yavuz twice but ended her years in an endless refit in Sevastopol started when the February 1917 revolution broke out. 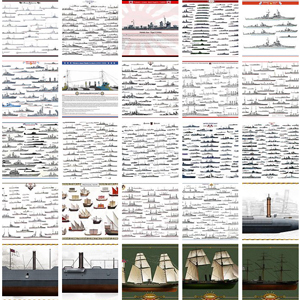 Not exactly a fitting career for arguably one of the best Russian capital ships of the 1890s. For the black sea fleet, the Russian admiralty in 1890 wanted a repeat of the previous Navarin, but improved on many points. The latter ship served with the Baltic Fleet, and the new battleship was to have much improved armour and armament on a 13,000 tons, 16 knots formula and built at Nikolayev Yards in Crimea. She was much larger than the Navarin (3,000 long tons more), displacing 13,318 long tons (13,532 t) -over 800 long tons over her designed displacement- while measuring 378 ft (115.2 m) overall (from the bow to the tip of the ram), 73 ft 3 in (22.3 m) in width and a draught of 28 ft 6 in (8.7 m). Overall, the Tri Sviatitelia was quite impressive, the best armed and by far, best protected ship in the while Russian Empire, only hampered by a slow speed. These ships were fitted with two three-cylinder vertical triple expansion steam engines. They were built by Humphreys & Tennant and produced a designed output of 10,600 indicated horsepower (7,900 kW) together. Steam came from fourteen cylindrical fire-tube boilers. They worked at a pressure of 128 psi. She driven shafts were connected to four-bladed screw propellers. On trials forced heat allowed to reach an aoutput of 11,308 ihp (8,432 kW), traduced by a top speed of 16.5 knots (30.6 km/h; 19.0 mph). This was acceptable for the black sea, but do compare this with the earlier USS Olympia’s 20 knots, which was an armoured cruiser bearing almost the same level of protection. 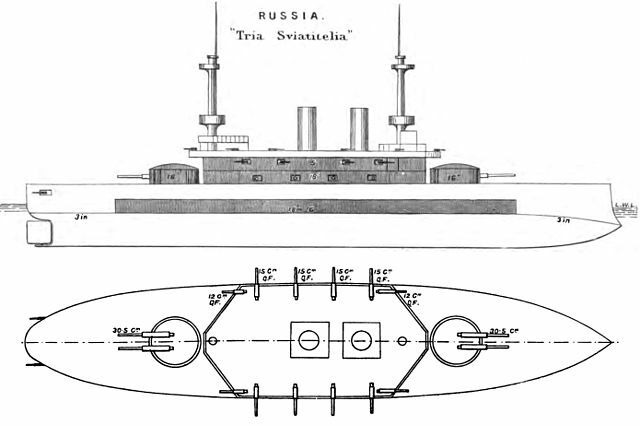 Tri Svititelia carried 1,000 long tons (1,000 t) of coal maximum. This provided her with a range of 2,250 nautical miles (4,170 km; 2,590 mi) at the usual cruise speed of 10 knots (19 km/h; 12 mph). In adition to steam power, she had three dynamos (305 kW total), enough to power part of the electrical onboard equipment. 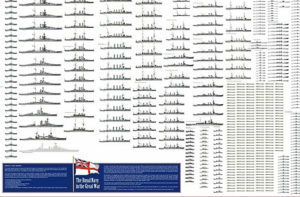 Like most pre-dreadnoughts of the time, Tri Svititelia presented a collection of ordinance, ranging from the usual twin 12-inch (305 mm) turrets, eight barbette or pivot 6-inch (152 mm) guns, four 4.7-inch (119 mm) guns and to deal with enemy torpedo boats, ten 47-millimetre (1.9 in) and forty 37-millimetre (1.5 in) guns (you read well!) and on top of that the usual close-range 15-inch (381 mm) torpedo tubes, six of them part underwater, part hull-based. The main guns were the excellent Obukhov Model 1895, 40-calibre. They had a rate of fire of about one round every two minutes on average (106 second) and can elevate 15 degrees and depress to −5 degrees. They fired a 731.3-pound (331.7 kg) shell at 2,598 ft/s (792 m/s) which made for a range 12,010 yards (10,980 m). 300 shells were stored in all. The secondary 6-inch (152 mm)/45 were all french-built Canet model 1892 mounted in upper deck barbettes. 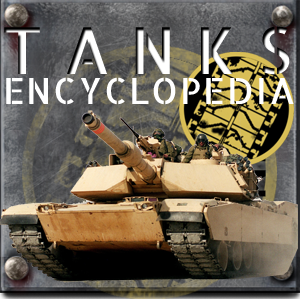 They can be elevated by 20 degrees and fired 91.27 lb (41.40 kg) shells at 2,600 ft/s (790 m/s). Range was even better than the main guns at 12,600 yards (11,500 m) at maximum elevation, allowing the use of combined weaponry at long range -with the problem of distinguishing between water plumes. Tri Sviatitelia, date unknown, with all white livery. The lighter artillery comprised intermediary 4.7-inch (119 mm)/45 Canet model 1892, an unusual choice to deal with torpedo boats, but they had an excellent field of fire, being mounted on the corners of the superstructurefired a still large 45.15-pound (20.48 kg) round, at 15 rpm but quite fast at 2,700 ft/s (820 m/s). They had the reach, range and explosive power to make mincemeat of any torpedo boat at a distance, way before coming into effective torpedo range and probably a good choice on paper. However this combination of calibers was a nightmare from a supply perspective. The ten 47 mm (1.9 in) of the Tri Svititelia tertiary armament were Hotchkiss guns and placed on the upper deck superstructure and embrasures in the aft hull. They fired a puny 3.3-pound (1.5 kg) shell at 1,476 ft/s (450 m/s) but up to 20 rpm, although at a more limited reach, close-quarters, of 2,020 yards (1,850 m). Next the 37 mm (1.5 in) also Hotchkiss guns (same rate of fire) were much lighter and therefore mounted on the fighting tops, upper superstructure, but also lower, in small hull embrasures. Their 1.1-pound (0.50 kg) shells could reach 3,038 yards (2,778 m) at the same relatively low velocity. While speed seemed not the priority of the design, armament was impressive, but protection was even better-looking on paper and certainly the best of all three. It was all made of Harvey armour (in fact she was the first Russian ship with such armor, both in quality and thickness, a record at the time), with a quite impressive belt thickness of 16–18 inches (406–457 mm) on 75 m and 8 feet (2.4 m) in height. The ship however was overweight and the belt was submerged instead of the intended above the waterline position. It was closed by 14–16-inch (356–406 mm) transverse bulkheads. 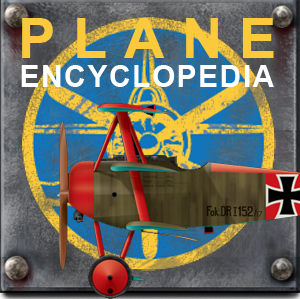 There were 2–3 inches (51–76 mm) plates for the deck with wooden planking above. The turrets were covered by a formidable 16 inches (406 mm) on the walls and the Conning tower looked almost thin in comparison at 12 inches (305 mm). This Harvey steel (the name was applied liberally to various foundries using the same recipe, such as Vickers in the UK or Schneider and Saint Chamond in France. Overall, the Tri Sviatitelia was more than a match for the Turkish Ottoman navy at the time. She was head and shoulders above anything the old Empire can throw at her. She started her carrer in 1896 after completion at Sevastopol, close to the arsenal, about five years after her keel was laid down (15 August 1891) and three years after she was launched, 12 November 1893. 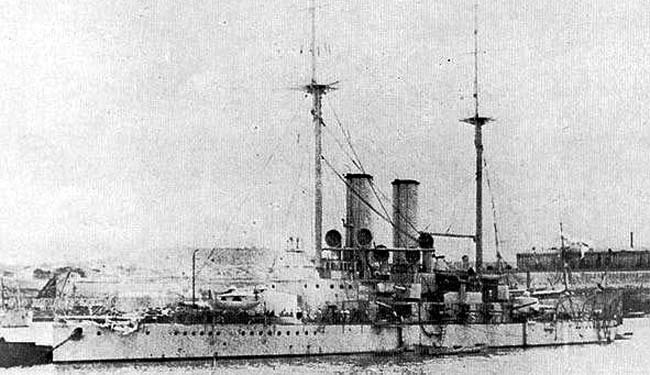 After she made her sea trials in September–October, she became the first Russian ship, and even the world’s first ship fitted with a radio, created by Russian physicist Alexander Stepanovich Popov. However range was ludicrously inadequate at the time, 3 miles (4.8 km), which made this little more than an experiment. She became the flagship of Rear Admiral F. F. Vishnevetskii during the mutiny of famous battleship Potemkin. She was the lead ship of a small fleet detached on 30 June 1905 to try to capture her. 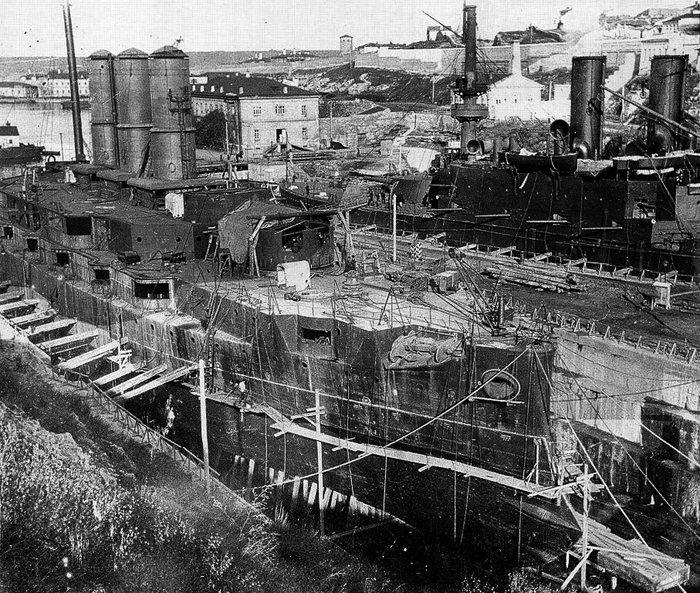 While her forward fighting top was removed in 1908, from November 1911 until August 1912, Tri Sviatitelia entered the drydock for a complete reconstruction. It was at first envisioned to replace her harvey armpur by Krupp one and replace the armament, but because of budget constraints this never happened. Instead, masts were lightened, fighting tops replaced, all the light guns and torpedo tubes removed. Just two 47 mm remained as saluting guns. The intermediary 4.7-in were also replaced to standardize secondary armament, by four shielded 6-inch guns, placed on upper casemate, which was modified to house two extra 6-in guns. Following the lessons of Tsushima, the superstructure were reduced. The main guns mounts and loading systems were revised so to elevate 25° more while the rate of fire jumped twofold at a round every 40 seconds. Her displacement slimmed by 100 long tons, stability progressed, and she was still capable of 16 knots despite the age of her machinery that remained untouched. 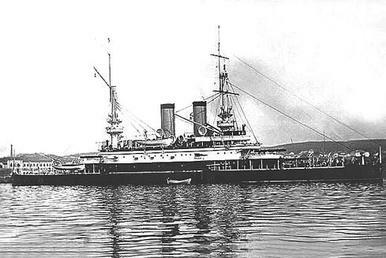 Tri Sviatitelia was based at Sevastopol, together with the Evstafi, the fleet’s flagship, Ioann Zlatoustand Panteleimon, renamed after her mutiny, and Rostislav. These ships made a sortie to shell Trebizond on 17 November 1914. They were caught when returning home by SMS Goeben and Breslau the following day on their return voyage to Sevastopol, the battle of Cape Sarych. The ships at first missed themselves in the fog. 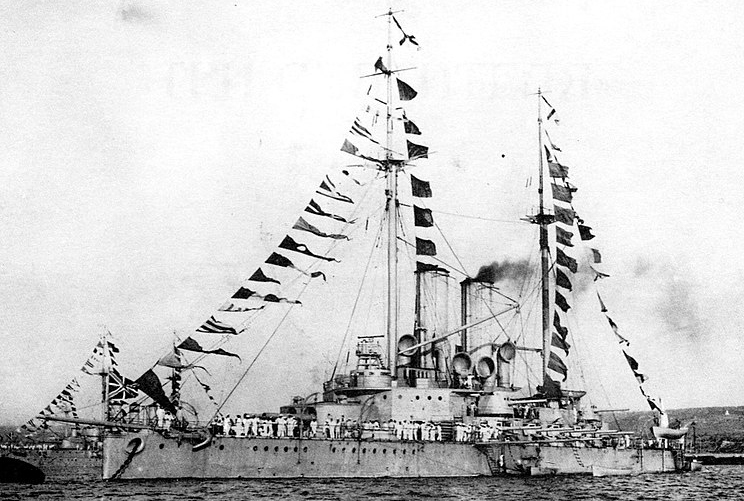 During this battle, the Russians were experimenting a fire coordination ship, with the Ioann Zlatoust as master ship. She spotted thee Goeben first and passed commands to the line ships, firing at at 4,000 yards while Tri Sviatitelia received wrong data and missed. 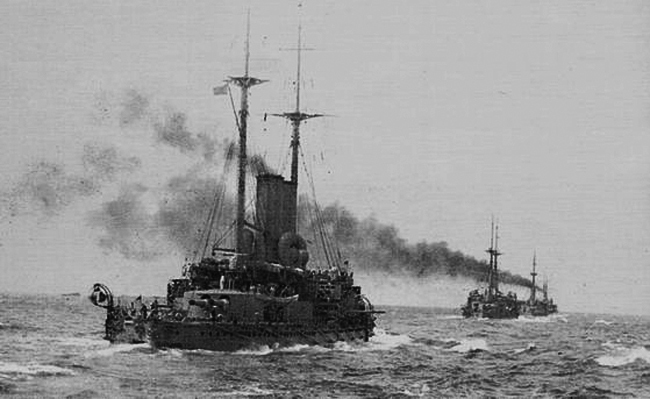 Tri Sviatitelia and Rostislav returned later to shell Ottoman fortifications at the Bosphorus entrance on 18 March 1915, delivering 105 rounds before returning to their cover force. 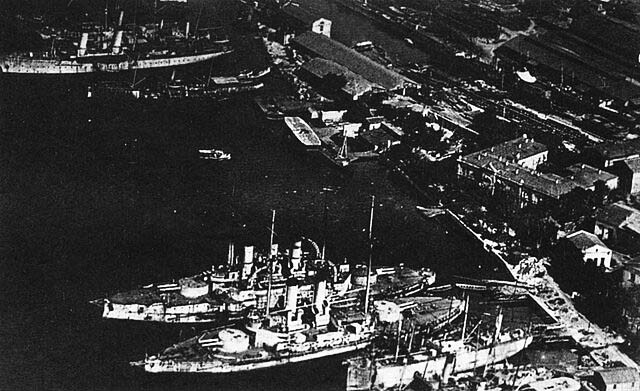 The following day heavy fog prevented a second raid, while on 3 April, the Turkish navy raided Odessa, forcing the Russian fleet to bail out and met them. Goeben was chased but never caught. On 25 April Tri Sviatitelia and Rostislav raided the Bosporus forts again and Panteleimon joined them for more actions on 2-3 May. On 9 May 1915, Tri Sviatitelia and Panteleimon made another raid with a cover, but the latter were intercepted straight away by the Goeben. Both sides exhanged fire briefly, scoring no hits. Meanwhile Tri Sviatitelia and Pantelimon sailed back to the cover when they spotted the Goeben and scored two hits, before both sides broke off although they chased the battlecruiser for six hours. Back as Sevastopol, Tri Sviatitelia received a pair of modern 63.5 mm AA guns placed on turret roofs and funnel screens to protect from light bomb drops. In August 1915 all the battleships became the 2nd Battleship Brigade while the new Imperatritsa Mariya class replaced them. 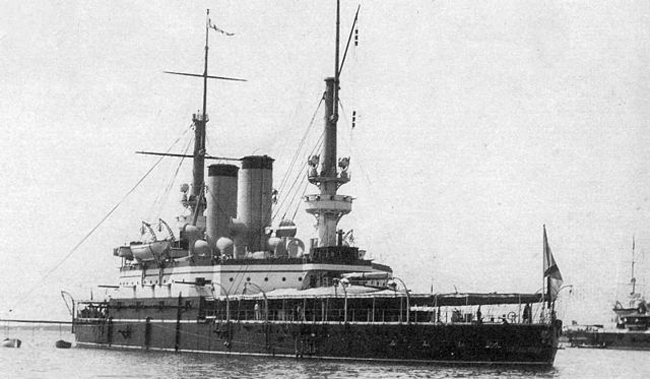 In 1916, the Russian battleship shelled and patrolled the Anatolian coast but without notable event. Tri Sviatitelia entered Sevastopol drydock as second time just when the February Revolution of 1917 started. As workers fled to join the movement, she layed uncompleted there for some time, to be captured by the Germans in May 1918. They in turn handed over to the Allies in December 1918 because of the Armistice. The British forced had her engines scrapped in 1919 when the Crimea was about to fall to the advancing Red army. But the stationary battleship was captured by the White Russians after the Blosheviks, and recaptured after they fled in November 1920. She was was scrapped in 1923, and stricken in 1925.